Cirque du Soleil has a legendary reputation for high-flying, gravity-defying stunts, eye-popping bodily feats and incredible design, so going in, I didn’t think I’d be coming out saying, ‘And those ladies with the cups, they were amazing!’ - but there it is. The third act of the night, in which a group of women on unicycles flip bowls from their feet on to their heads – their own, each others, forwards, backwards and every which way – is enchanting. The accuracy, agility and sheer nerve is impressive. Part of the reason this act is so enjoyable, though is that this is the only act of the evening where women are part of an act independently. The rest of the acts that women appear in (about 30%), the women appear somewhat decorative, more a part of someone else’s act than a performer in and of themselves. The programme declares that TOTEM charts the progression and history of ‘man’ from amoebas, to crawling out the water, to businessmen and our current and future exploration of space. When this is most literal it is at its best: a diamanté-encrusted acrobat, best described visually as a human glitter ball, representing the human life-force, descending upon a structure quickly filled with writhing bodies in reptilian morph-suits; a futuristic group of astronauts walking in the air. Others seem crowbarred in, especially as they are not presented in chronological order. There’s a rather silly ‘two men fighting over a girl in a bikini’ sequence as the second scene, and although displaying some incredible aerial hoop work that sees the two men fly almost into the audience, it is a bit too hackneyed, and as part of the overall theme, doesn’t seem to fit in. I suspect some of these comic interludes are for the benefit of the kiddos, and in that department, they do seem to be appreciated. There is no doubt that the skill of the circus performers in this production are the best you will see in 2019. The trapeze artistry is stunning; the contortionist is so good you will want to vomit. The setting of Royal Albert Hall, where the group have a residency every January since 2009, is perfect for a show that includes breathtaking moments from all angles, and the set includes a very well-utilised large-scale projection which often represents a body of water. One can’t help but wonder whether that long a residency might encourage complacency. 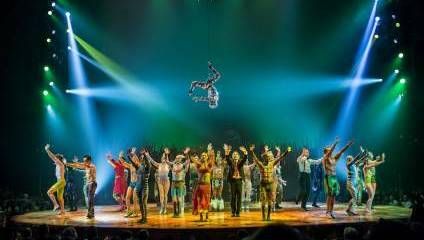 Cirque du Soleil pride themselves on being a modern circus, and in production value, they certainly are, but despite its glitz and glamour, TOTEM doesn’t quite manage to fling itself into the 21st century.